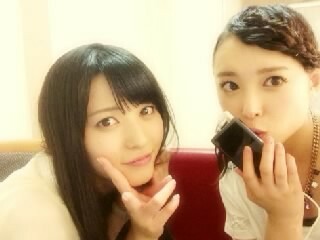 Fellow ℃-ute member Nakajima Saki shared this 2-shot with Maimi in her update on the official ℃-ute blog (1). The “UTB” magazine Twitter account tweeted this “refreshing shot” of Maimi while promoting the issue ℃-ute appears in (2). Posted on August 3, 2013, in Articles and tagged Nakajima Saki, Yajima Maimi. Bookmark the permalink. Leave a comment.